Since my original posts on email preference centers and subscription management, many firms have gone well beyond the basics, building dynamic pages that literally speak the lead’s language. 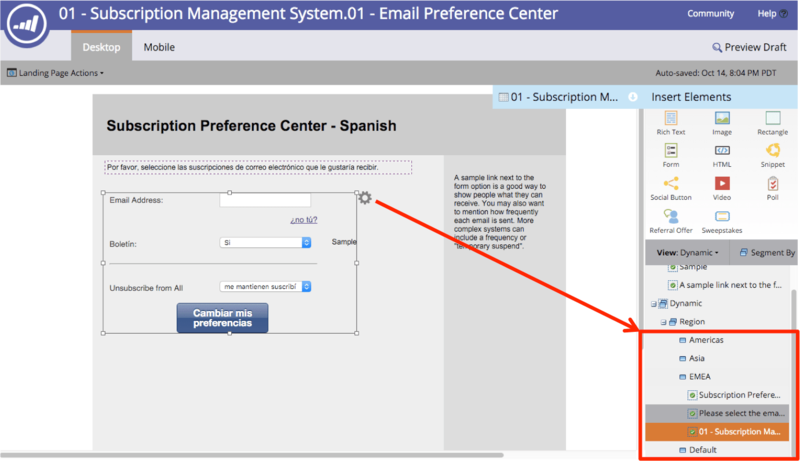 Here are updated instructions on building the ultimate subscription management center (or email preference center) in Marketo. The process involves four phases to achieve pages in dynamic languages. Every customer receives the standard Unsubscribe page when they first turn on Marketo. This page helps you conform to the minimum legal standard in most countries. If you are smart, you will want to build out a subscription center fast to reduce total unsubscribes and encourage people to subscribe to different kinds of communications. Remember, these are examples. You may want to add more like Fax, SMS, and other channels. When I create these fields, I usually use a picklist in Salesforce first, with Yes, No, “null” as values. This way, the system is easy to understand whether you are an engineer, salesperson, marketer, or machine. This program should be Channel=Operational. In some situations, I have created a separate Channel called “Subscriptions” where the statuses are Opted In, Opted Out and the Type is Operational so reporting is not affected. This only helps you with the counts and is totally unneeded from a technical perspective. Up to you. This is how I set up my folders, which is largely the same across all Program Channels. Note the leading number ensures the order is how I want it. The reason we create this page first is to ensure the Form is completed more quickly. You will use this page several times, so might as well do it first. Most of my clients request the Confirmation page to reflect the new values provided. This is pretty easy with some tokens. As I mention in the sidebar above, it is possible to display a human value. This is why I almost always use a picklist for each field with Yes/No/Blank. Blanks mean that the lead hasn’t made a selection and we cannot send to them yet. The default token will say “Not Selected”. Remember to check Meta tags: set this to noindex, nofollow as this page should not be found. 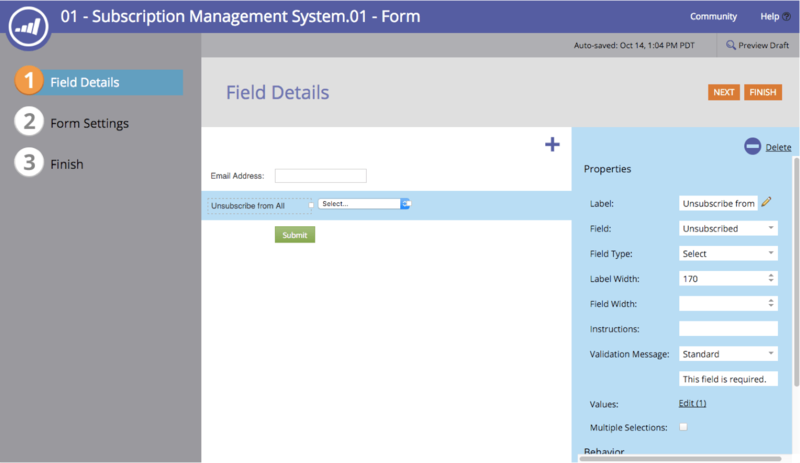 Here is an example form and how to set the fields. Your Form will look different. Modify the Values as needed. 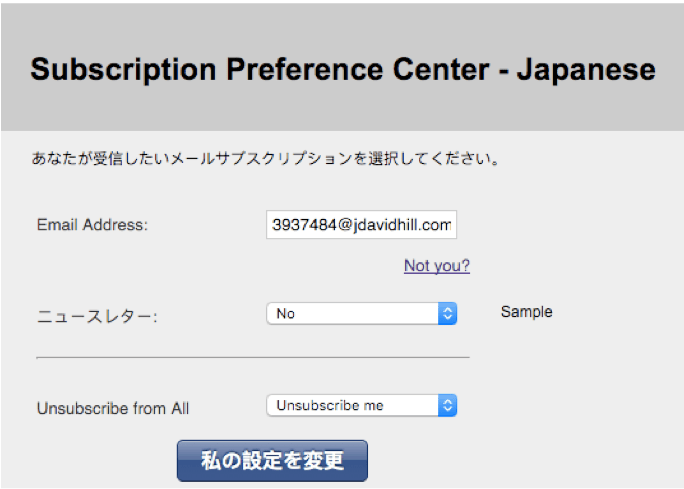 In this case, I want Unsubscribe All to encourage people to do what I want, but you can leave it as a simple checkbox. On this form, we will keep everything as Not Required and Prefilled to show the current settings. You may want to mention that on the page. Set the Confirmation page on the Form to ensure that it always goes to the right place. This is the main page you will point everyone to. Meta Tags: the default is Index, nofollow. In general, it is safe to leave this because you do want this page to be found. Remember to test everything once it is turned on. You may want to use an email address brake on the Unsubscribe All campaign until you are ready. Step 8: Update Admin > Email with the appropriate URL. Please visit this page to understand this area. 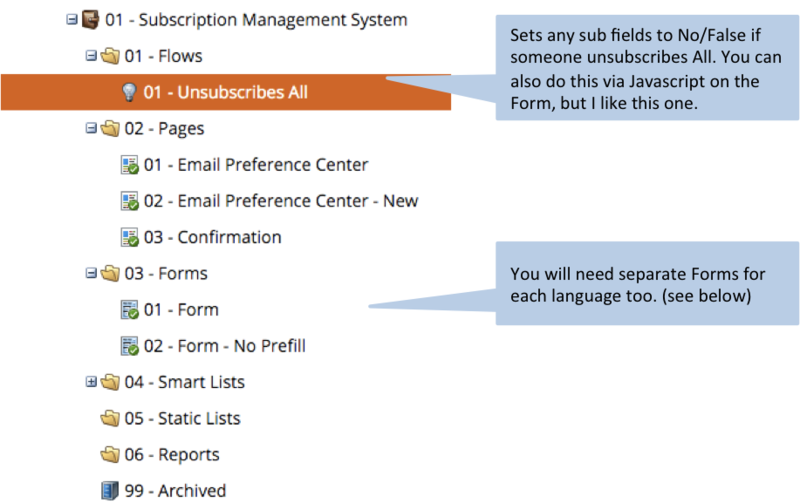 Gregoire Michel wrote a detailed How-To on the Unsubscribe Link. Back it up the original text. Take URL and add to Admin section or Email Template as desired. as it is now unneeded and will cause problems. Please send yourself a Live Test to confirm the new link works as intended. Once you are finished with the tests, I recommend creating a redirect in Admin > Landing Pages > Rules to point the original Unsubscribe page to your new page. This ensures that anyone who finds the original page or clicks on the old link finds themselves at the correct place. **Remember to approve and re-approve Forms and Pages when you update them. Also, there is a durable unsubscribe in Marketo and a lead can only be re-subscribed in a particular way. 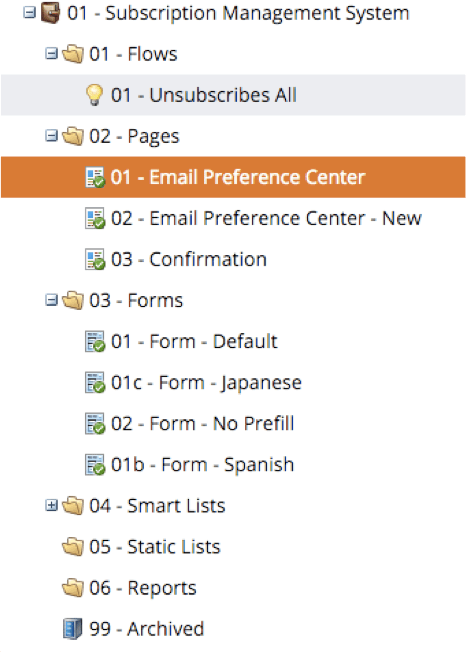 Email Preference Center Phase 2: Not You? Email was forwarded and another person messes up the lead’s data because of the token in the email identifying the original recipient. Allowing people who find the page to Add themselves to your database. (Yeah, rare, I know). To make this happen is fairly easy. There are two methods: Easy with more assets; and Hard with coding. Let’s talk Easy. Meta Robots: set this to noindex, nofollow as this page should not be found on its own. Add link to Not You under the original Email Preference Form as shown. Have the Not You link reset the page without the munchkin identifiers. Go to the second page without any munchkin. 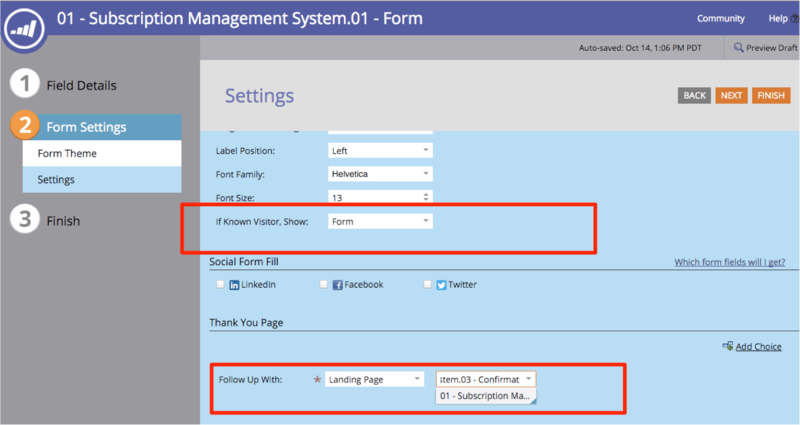 I like Easy and it takes advantage of Marketo’s existing features. If you are operating programs internationally, especially at a fairly large firm, you will eventually need to implement a regional or language friendly system. The process is fairly simple, however, I would urge you to test it carefully. Option 1: one subscription page per Region. The overhead increases because you have to manage the links in your email template footers. This option takes partial advantage of dynamic content. Option 3: one subscription page to rule them all. This is much better, however, I urge you to test it a lot before going live. We’ll talk about this one in Phase 4. With Option 2, you get to try your hand at Dynamic Snippets. This is a fairly underused feature of Marketo, which can be very powerful if thought out. Step 2: create the dynamic content for the snippet. I recommended using one Segmentation per asset to avoid confusion. Once this Snippet is ready, test it on an Email that uses a Template with a Footer as editable. The results should flow through automatically in preview or a Live Test. Of course, the holy grail is Option 4: just using one page for everything. In this situation, we will add new ingredients and modify the original Email Preference Page to be dynamic. I will go through most of the steps, but be sure to read the docs on setting up Dynamic Content and Segmentations in order to follow along. Please remember that your Segmentation Segment order and smart list criteria will determine which Language is visible to the lead. 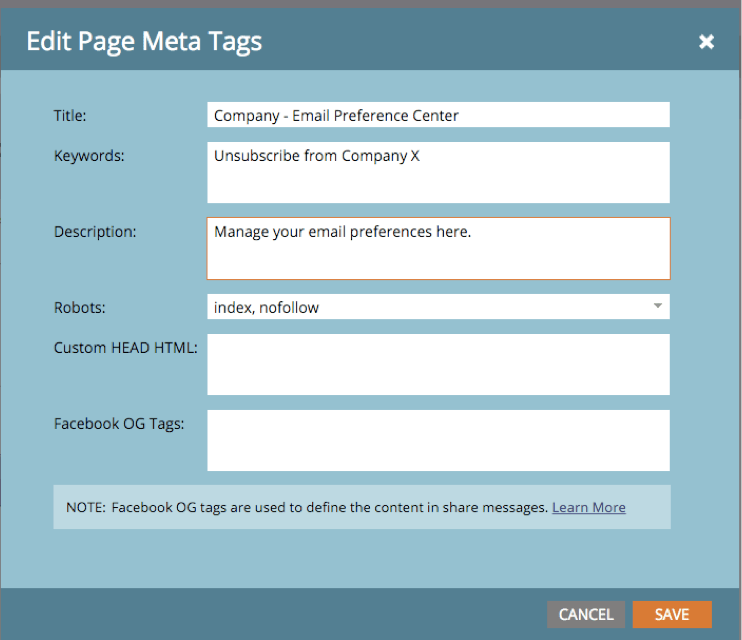 Modify the original Email Preference Page to use Dynamic on the Form and any other text. **The Not You Page will still be the Default Form because new leads won’t have a Segment yet. Remember to set the Default to English or the major language of your audience. Here is an example in Japanese I made using Google Translate. If you already have a live Preference Center, I highly recommend that you clone the original Preference Page and Confirmation Page to test these Forms before going live. Look how cool this is! Is it all clicking now for you? You will have to add all the Forms to the Trigger. Feel free to test it. Double Opt In – this is required for GDPR. It’s a good best practice and ensures email validity and engagement. All you need to do is add a flow or two to send out a confirmation email and link whenever someone subscribes. They click on the link and your second flow handles the final steps. Confirmation Email – please avoid this unless it is for Double Opt In. If I unsubscribe, I don’t want a final email. Use the Confirmation page for this. Leave me alone for a while. This option was first made famous by Marketo years ago. In this system, you ask people if they want to suspend emails for 30 days or more. The challenge is in setting up the workflows and lists to properly suspend someone for that period. Remember, the simpler methods work best. 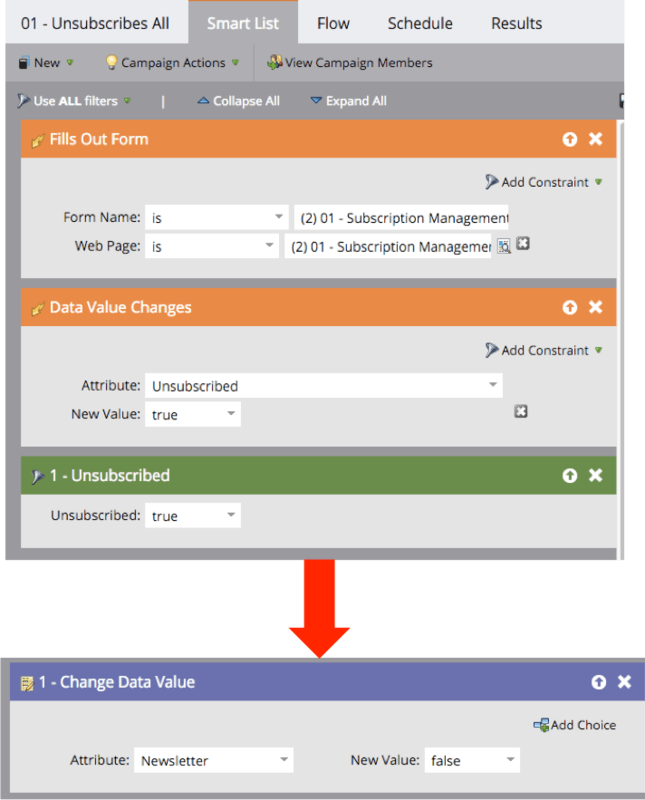 List Setup – of course, you will want a set of smart lists and even static lists to manage people who are Opted In vs. Out by Subscription. You will also want to update any suppression lists. Interested in having your own custom email preference center? Contact Etumos. Nice article, thanks. Currently investigating Marketo and requirements for GDPR compliance. sure you can do this. Just map out the requirements and workflows. Fancier things like Web Opt Out or data storage may be a bit harder, but you could offer a Form to ask for that. What is the rule with new users who want to optin into multiple lists with 1 subscription and the double optin feature? Ie: I’m a new user and I want to subscribe for newsletter, events and newsflashes. Is there a double optin necessary for all 3 lists? or is there a general one that combines all 3? Do you mean the legal rule in EU with GDPR? My understanding is you can subscribe on one page or form fill, but the marketer would have to show you all 3 options, or at least tell you those are the things you opted into. Double Opt In is only in Germany and some other jurisdictions. Best to see https://www.marketingrockstarguides.com/marketo-privacy-regulations-gdpr-3226/ and work with your legal team to confirm the exact scenario you want to accomplish.